will be a familiar dish. 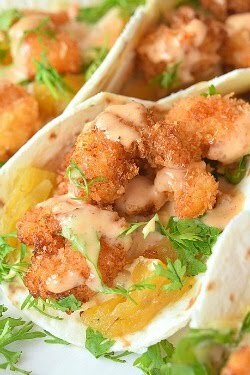 Its so amazingly flavorful and spicy plus can be put together under 30 mins! 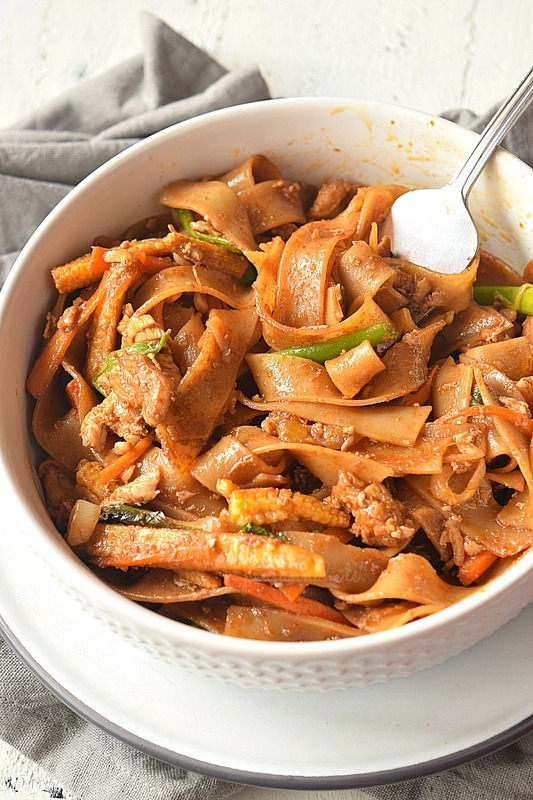 Even if the recipe name says "Drunken Noodles" but the recipe does not call for any alcohol to be added! Yes when I had first tasted this dish ,I was a bit skeptical as to why the dish is called Drunken Noodles (Pad Kee Mao) but when I read the ingredients I came to know that the name is Drunken but the ingredients do not call for any alcohol. 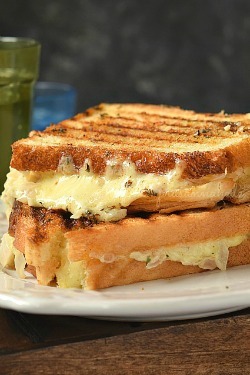 The name of the dish is based on different stories associated with the origin of the dish! 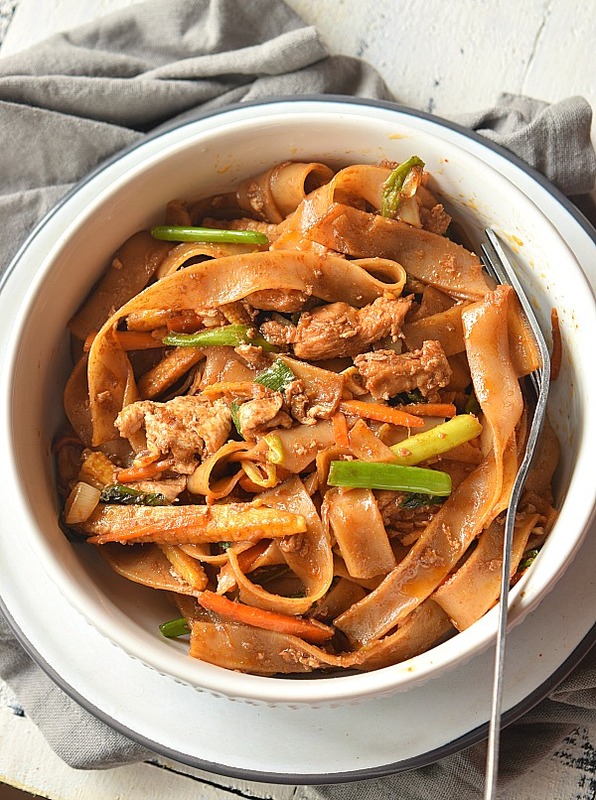 This recipe of Drunken Noodles is very easy,spicy and easy to put together in under 30 mins! The ingredients are very basic too and should be readily available in your pantry if you cook Thai / Chinese food frequently. 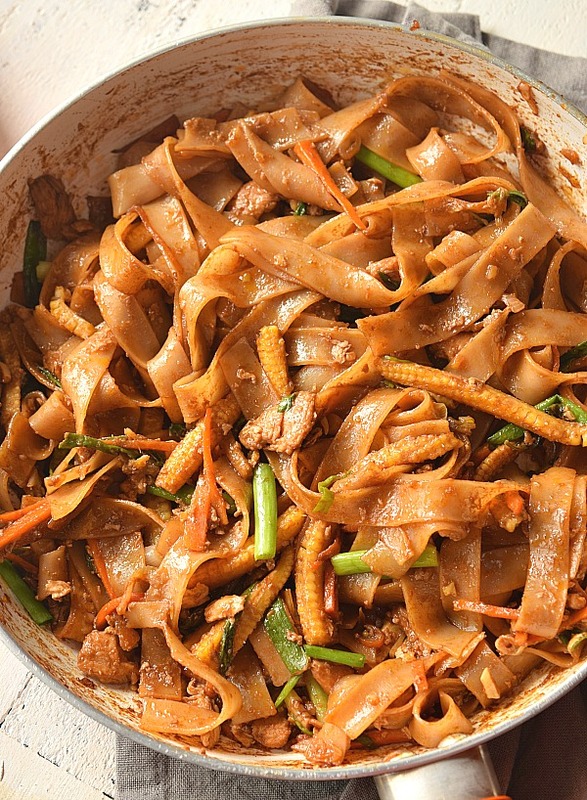 What is Drunken Noodles (it's Origin)? In Thailand this dish is popular and is available on almost all restaurant menu's plus now its popularity is getting it more fans across the world too. 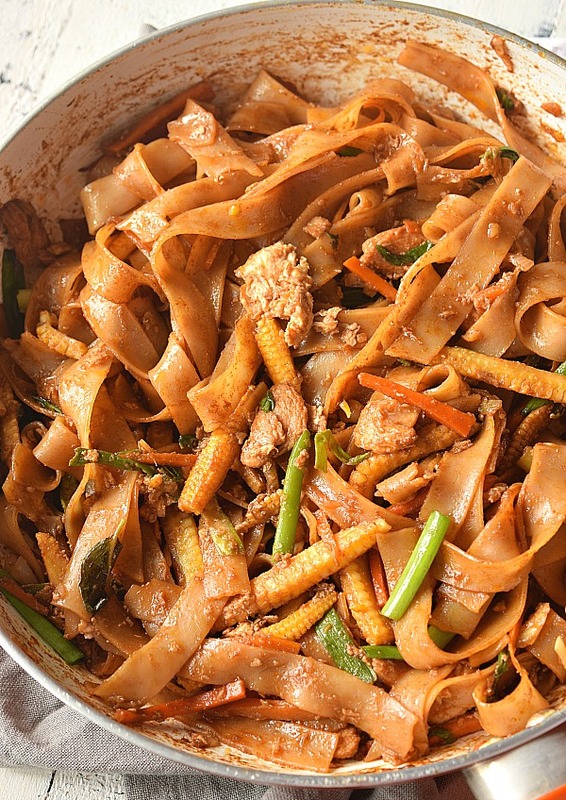 Drunken noodles (or pad kee mao, less frequently pad ki mao or pad kimao ) is a stir fried noodle dish very similar to phat si-io, but with a slightly different flavor profile. In Thai, khi mao means drunkard. It is normally made with broad rice noodles, soy sauce, fish sauce, oyster sauce, garlic, meat, seafood,chili, fresh black pepper pods and holy basil, which give rise to its distinctive spiciness. "Drunken fried rice" or khao phat khi mao is a similar dish. 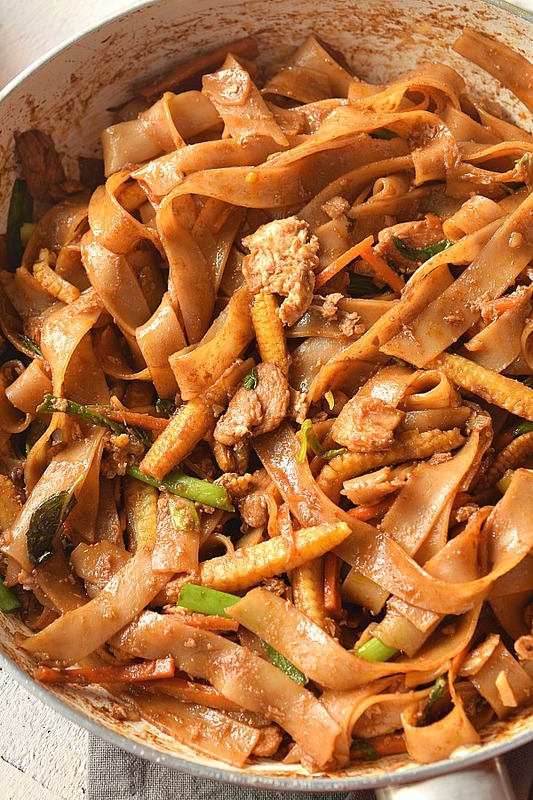 What stories are associated with Drunken Noodles? Several theories exist on the naming of this dish. One states its origins stem from the use of rice wine in preparing this dish, but no alcohol is added in any of the original Thai recipes. Another supposes that it was devised by someone who came home drunk and made something to eat with available ingredients. Another slight variation describes using what remained in their fridge to cook a side dish for their alcohol drinking. In that vein, a more apt name might be "drunkard's noodles." 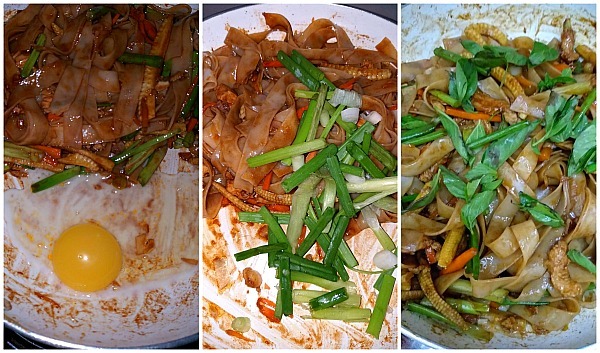 What is the difference between Phat Si Ew and Pad Kee Mao? 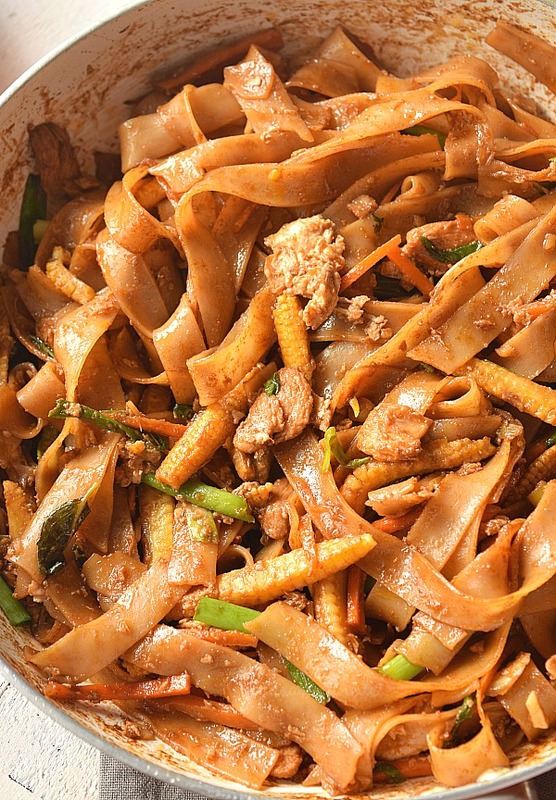 This dish(Drunken Noodles) got more popularity in Thailand, after some Chinese immigrants crossed the borders in surrounding countries and started to sell a Chinese influenced stir-fried noodle dish called "Phat Si Io/ Phat See Ew". In Thailand the dish got slightly changed to get a very good flavor and spiciness to this dish by adding Thai Basil leaves and Thai Red Chili Peppers. 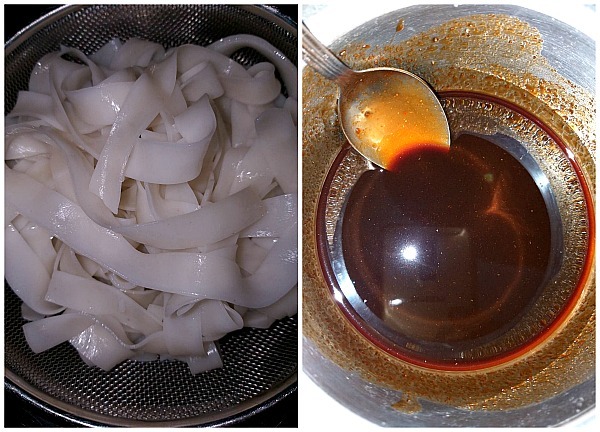 Flat Rice Noodles: The noodles used in this recipe is Broad Flat Rice noodles. If you do not find them handy in stores near you then you can use any other rice noodles or any other noodles of your choice. Thai Basil: Thai Basil is added to this dish to add that extra flavor which makes it so unique and different from Phat See Ew. Thai Chili Peppers: The spice in this dish is from Thai Chili Peppers. You can tolerate heat then go ahead and use these in good amount but if you cant handle heat then better skip it or use maybe just 1 chili pepper . 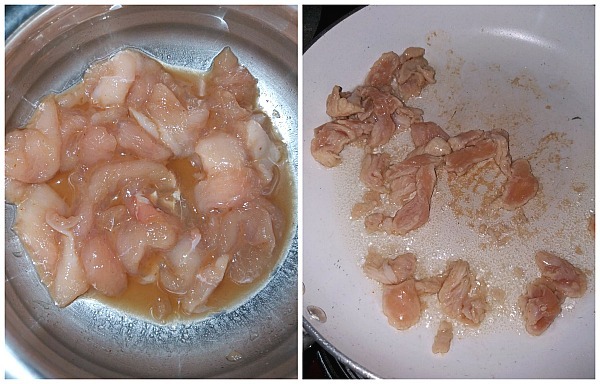 Chicken: I have use Chicken Breast meat but you can also use Thigh meat. That is more juicy and flavorful. 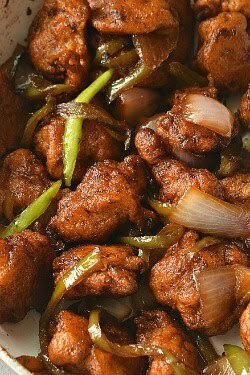 Breast meat is normally tends to get dry when cooked in stir fry dishes. Always go for tenderizing the chicken or velveting the chicken. In most cooking styles this done by applying Baking Soda to make the chicken soft and juicy. I have made this step by skipping soda but instead marinate the chicken with soy sauce and cornstarch. Eggs: In this recipe the eggs are not scrambled and then added to the dish like mostly done in fried rice or other noodle recipes. Here break an egg directly into the pan and then after a gap of few seconds stir all the vegetables along with noodles,along with egg to coat the noodles well. Sauce Mix: The sauce calls for a mix of Sriracha, Rice Wine Vinegar, Oyster Sauce,Soy Sauce,Fish Sauce and Brown Sugar. What is the Sauce made of? 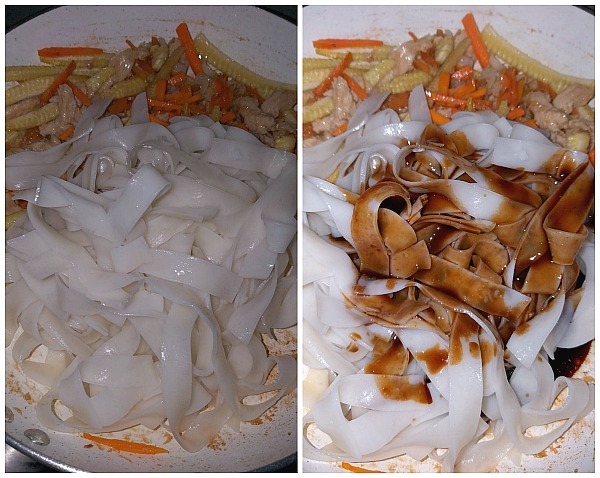 Firstly prep the flat rice noodles for the dish. Here normally the rice noodles do not need cooking. Follow the package instructions. I had soaked the flat rice noodles in hot water for 15 mins. Then drained and tossed with some oil.Keep it aside. Next in a mixing bowl add all the ingredients for the sauce mix. Mix well and keep this aside. In another bowl, add the chicken pieces with soy sauce and cornstarch. Mix well. Do not add any water. Heat the pan with little oil and with help of fork or pair of tongs add all the pieces to the pan. Stir fry immediately till cooked. Do not use if any marinade left,discard it. Move the chicken pieces to one side of the pan,add little more oil and add ginger and garlic. Fry till fragrant. Do not burn them. Next add the veggies and again fry them further till slightly crisp. Next add the Thai chili peppers chopped and mix once. Next add the noodles and pour the sauce mix . Mix everything well. Move everything to a side of the pan. Break an egg into the pan and let it sit for 5 seconds. Keep the heat on medium throughout. Do not stir the noodles much as they tend to break. Quickly get all the noodle,chicken and veggies mix over the egg and mix well. Here do not scramble the egg and add to the noodles. Add spring onion cut long and Thai basil leaves. 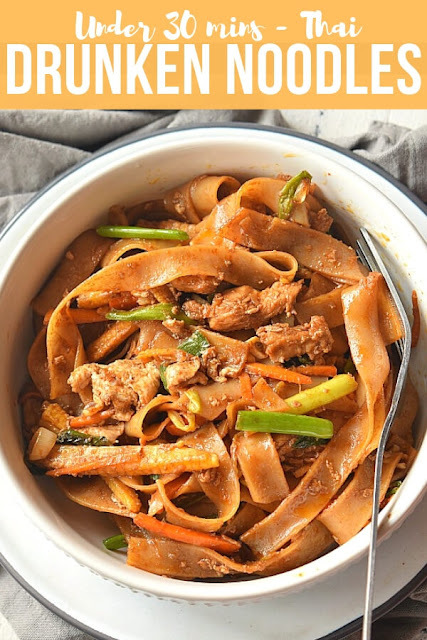 These Easy, Spicy, Thai Drunken Noodles are best for weekend or even when you crave for spicy food- Soft,flat rice noodles stir fried along with soft juicy chicken,scrambled eggs,carrot sticks,scallions,baby corn all cooked in spicy sauce mix.Try this amazingly easy recipe which will fix your spicy noodle cravings under 30 mins! Prep the noodles as per package instructions. I have soaked the noodles in hot water for 15 mins,then drained and tossed with little oil. In a bowl add the ingredients for the sauce mix. In a separate bowl add the chicken,soy sauce,cornstarch,salt and toss well to coat well. Heat a pan with 1 Tbsp Vegetable oil and 1 Tbsp Sesame Oil. When hot add the chicken pieces with fork and discard the marinade. 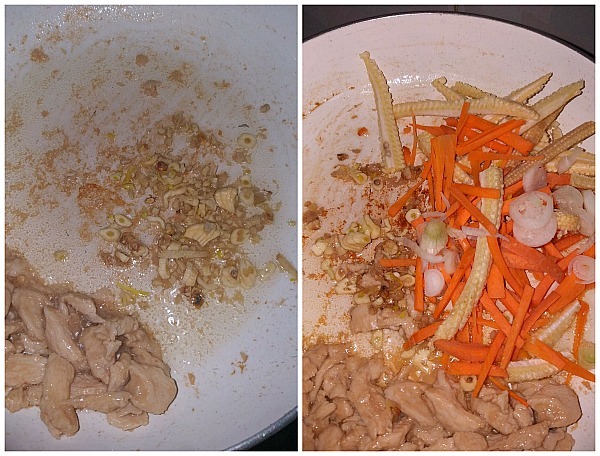 Stir fry quickly till chicken is cooked well. Add another 1 Tbsp Vegetable oil to the pan. Move the chicken pieces to one side of the pan. Add ginger and garlic,fry till fragrant. Do not burn these or final dish will be bitter. Add the veggies(carrot,red onion,babycorn) fry further. Move this again to the side of the pan. Add the thai chili peppers and mix well. Add noodles and sauce mix. Mix well once till everything is coated well. Do not stir the noodles much or they will break. Move this to one side of the pan, break an egg into the pan. Wait for 5-8 seconds and then mix everything well. Do not scramble the egg,rather mix everything well to coat the noodles. Add the spring onion long cut and thai basil leaves. Adjust salt and sugar level. 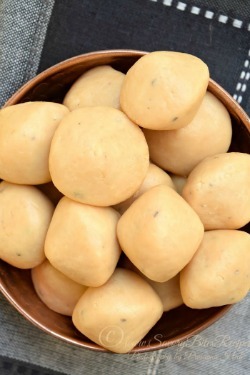 Toss once or twice and serve immediately.